Mathoor Hanging Trough (மாத்தூர் தொட்டிப்பாலம் or Mathur Aqueduct) is the tallest as well as the longest trough bridge in Asia, having a height of 115 feet and a length of one kilometre. The bridge has been constructed in 1966, this bridge has become a place of tourist importance and hundreds of tourists visit this place daily . This is situated in Mathur, hamlet of Aruvikkarai revenue village in Thiruvattar Panchayat Union, about 60 km from Kanyakumari and about 60 km from the city of Trivandrum, the capital of Kerala state. 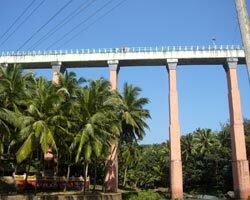 The bridge has been constructed at Mathur across the Pahrali River (Parazhiyar) and the trough canal (Pattanamkal canal) on the bridge carries water for irrigation from one side of a hill to the other side of a hill. From the centre of the Aqueduct, one can see a vast expanse of greenery, with rolling hills of the Western Ghats in the background, and the meandering Pahrali river flowing below. The trough has a height of seven feet with a width of seven feet six inches. The canal is being shouldered by 28 huge pillars. By the unrelented efforts of late Thiru. K. Kamaraj, the former Chief Minister of Tamil Nadu, as a drought relief measure and for the development of agriculture in Vilavancode and Kalkulam Taluks. The District Administration has recently put up a staircase from top to the bottom of the bridge and also built a children's park and bathing platforms over here. 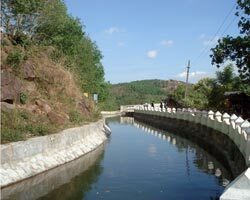 The bridge and the lush green surroundings are noted for scenic beauty.